Let me just say, for the record that flying from one end of Australia to the other end is a lot harder than one thinks! And I’m not just talking west to east, I’m also talking north to south. So many flights, so many hours and a couple of layovers make for one hectic journey. Regardless, the 12 hour travel time to get from Port Hedland, in the north-west of Western Australia to Hobart, the south-east end of Tasmania is well worth it as both landscapes serve to remind how glorious Australia really is. As Hobart is one of our capital cities, I imagined it to be quite busy and all shiny skyscrapers and pushy people. Instead, Hobart is a charming, friendly and quaint city that makes you feel comfortable and never fails to amaze. Filled with historic buildings (sadly some were empty and neglected), lots of side streets and far too many hills for my liking this is the perfect place for those who enjoy city getaways but with half the hustle and bustle of bigger cities like Melbourne or Sydney. While these are only on Saturday mornings, if you happen to be in Hobart on a Saturday I’d really recommend getting up early to get to the Salamanca Markets. While they don’t open till about 8am, I loved watching everyone set up and also having the place to myself. I got to browse at my leisure, chat to the wonderful locals and have the best pick of everything. Once 9am hit it was super packed and less enjoyable, especially when you need to jostle for space or wait in line (dull). Lots of yummy food including freshly made empandas and olliebollen (Dutch-style doughnuts), gorgeous fresh flowers and souvenirs, it’s a great place to pick up gifts for yourself and others. If you haven’t had enough to eat for the morning, wander over to Small-fry on Bathurst Street in the CBD. It’s pretty small so you have to keep an eye out but just look for the people having coffee and it’s there! There’s limited seating so hopefully you can squeeze in, and it’s worth it as the chef whizzes around the kitchen in one uniform, fluid motion making everyone’s breakfast. I had the omelette which was perfect, and a beautifully made coffee. If you’re not up for breakfast, you can just order coffee which I highly recommend. The perfect boat window shopping spot in all of Hobart, Franklin Wharf. This is a beautiful part of Hobart, right on the water with lots to look at and places to just sit and admire. Growing up in a port town I’ve always loved just watching ships and feeling the ocean breeze, so I really enjoyed Franklin Wharf. There was a cruise ship in that day too meaning there was a lot of activity in this area, making it all the more lively and vibrant. There are some great restaurants around here, and if you’re a keen photographer there’s a lot to capture – so many textures, colours and endless sea and sky. 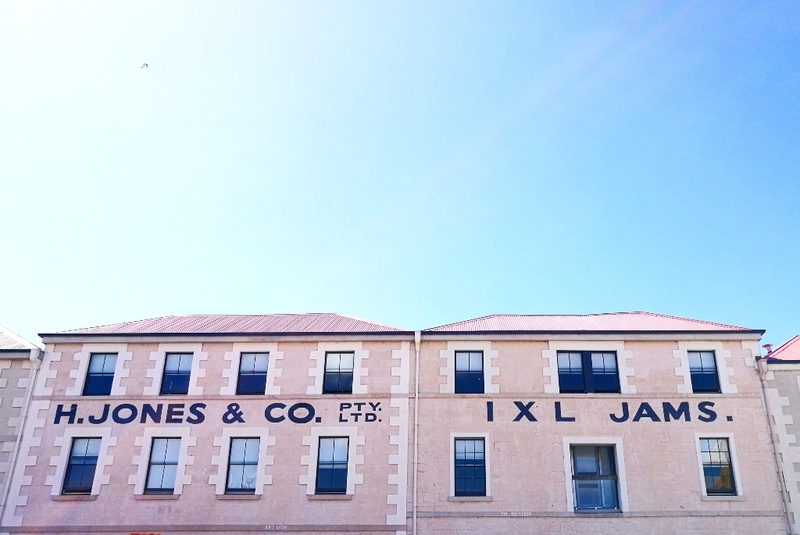 There’s also the original IXL Jam factory (I think this is a uniquely Aussie brand? Correct me if I’m wrong) which is a beautiful historic building, and the pub The Drunken Admiral which is also another gorgeous sample of Tasmanian architecture. One of my fave buildings in the Franklin Wharf area – I do love a vintage pink building! I actually didn’t do this, however have heard it’s highly recommended and judging from the view from the other side, I have to admit I regret not taking the ferry (I opted for an Uber as I was on a bit of a tight schedule). There are two types of tickets – the standard at $22 per person, or the Posh Pit, which includes drinks and canapes in their lounge, bar and private deck ($55). It does leave the Brooke Street Pier (in the Franklin Wharf area) at 11am so get a ticket and hop on! A panoramic shot of the view from Mona’s entrance – just perfect! The ferry ride takes about 25 minutes (according to the website) so you should arrive at 11.30am. The grounds are beautiful and whether you choose to explore before or after is up to you. Word of warning – you will spend at least 2 hours, if not more in the museum so if you feel a case of the hangries coming on, grab a bite to eat at the cafe before heading in. If not, prepare yourself for an art lesson you’ll never receive again! I won’t go into the history of Mona as you can read about it anywhere; however I will say that not everything in here will be to your taste as it wasn’t to mine, but explore with an open mind for true Mona experience. There is a ferry leaving Mona at 1.45pm (the next is at 3pm) so if you’re done just before this time, hop on for the return trip; if you finish outside of these hours, grab a wine from the restaurant outside while you wait for the next ferry or simply grab an Uber back into town. If you’re feeling a bit pooped from all the walking and art gazing, duck to Zimmah for a pick-me-up cup of coffee (219B Murray Street, down an alleyway behind a print shop). It’s the cutest little cafe, with stacks of books as columns, delicious coffee and guilty-but-delicious desserts. Rest your weary feet and build up your energy again in this secret yet popular spot. Cyclo Vietnamese Restaurant – just next to the Shell petrol station, it’s a great spot for people watching as well as serving up some yummy food. Hobart Cat Cafe – I never went inside but I did love standing outside the window and just looking at all the cute little cats! Sweet Envy – I love all things sweet and this locally-owned patisserie is to die for. How I wished I were 21 every time I stepped into that shop, just so I could eat everything in there and not have it go straight to my waist! The macarons were to die for and you can see the owners truly love baking. They also have a competition where you have to eat a cupcake with no hands for under a minute, and if you do you get the cupcake for free! North Hobart Post Office – for the pure fact it’s housed in a historic building and it’s the cutest post office I’ve seen so far! Makes for a great photo. Berta – another great little cafe, serves a pretty eclectic breakfast menu. I had the Japanese omelette with sake mushrooms, spring onion, kewpie mayo, okonomiyaki sauce and miso toast – YUM! Coffee was pretty good too. Beautiful old private house – ok, so I don’t know the name of it but I noticed it as I was walking home from the supermarket. It’s this gorgeous old house on the corner of Elizabeth and Lyndhurst Avenue. Actually there are two houses on both sides of Lyndhurst Avenue that are just amazing. Eurgh, I die. Two of my favourite spots in Hobart, these are next door to each other and located in the original cinema building. I spent many hours in the bookstore, browsing and admiring their collection of fiction, biographies, fashion books, cook books, kids books and travel books and maps. The State Cinema showcases high-brow movies (can’t think of any other term!) and if you’re looking for blockbusters, head to Hoyts instead because this classy cinema is geared towards those who prefer the tear-jerkers and thought-provokers. Movies are rarely sold out, so you could pop in and buy a ticket, however it is advisable to purchase online just in case. What makes this cinema special is you can drink wine and beer while watching your movie. The cinemas downstairs are way more comfy, with leather sofa-style chairs, instead of the typical cinema chairs. Literally, go home and freshen up for dinner. Enjoy a picturesque Hobart sunset before getting ready for a night on the town. There are so many amazing dining options in Hobart, you are spoilt for choice ranging from simple and hearty budget meals, to high-end seafood and steak. I think Cargo is the perfect balance in-between, with pizza, tapas and more substantial meals on offer. There’s also a fairly extensive drinks list so if you or a your friends like a tipple, then this is the perfect spot. It can get pretty crowded at this time, so if you prefer somewhere quieter there a lot of other similar spots along the Salamanca Square area; or head to Franklin Wharf where there are lot more seafood restaurants. Hobart is not quite famed for its nightlife, so it’s up to you to make your own fun. There are a number of bars in the Salamanca area and North Hobart, and some dive bars if that’s more your style. The Republic in North Hobart has live music each weekend, and they often have some great acts – from memory when I was there they had Illy playing one weekend, and some other Aussie acts whom I’ve forgotten. I was quite impressed! Otherwise there’s the Observatory on the Salamanca Wharf which has been described to me as a cesspool of horny 19-21 year olds (not my taste haha) and a great little Irish pub in the same area. As they say in French, la nuit est a nous! Getting lost and discovering this beautiful mural in a small lane in the CBD. Getting there: there are no direct flights to Hobart from Perth, which does sound odd but it is a very small airport so I don’t think they could cope with direct flights from all over Australia. If you’re travelling from over east, then getting there is easy. You can also take the ferry from Melbourne which is actually more expensive than flying but handy if you’re travelling with a car already. Getting around Hobart: the bus system in Hobart is pretty good if you’re living in or around the CBD area. The buses do go out to the outer suburbs but judging from what I researched, it’s quite limited. Like all bus services, it’s not always on time but you’re on hoildays, so relax! Another great and affordable option is Uber – it’s so cheap and Hobart is so small so it never takes that long to get from A to B. Street art: Hobart is home to some great street art, all over the CBD and North Hobart. Spend the day wandering the streets and discovering the creativity that forms the foundation of arts and culture in Hobart. Born in Brunswick, 410 Elizabeth Street, North Hobart – possibly one of the most hippest cafes I saw in Hobart (the other being Room for a Pony, also in North Hobart). The coffee is amazing, as is the customer service and staff. The food is a wee bit too fancy for me (I had some Japanese-inspired salad which was a bit difficult to eat because of all the frills), but still tastes amazing. Prices are pretty affordable for a cafe of this quality. Villa Howden, Howden Road – this is a beautiful hotel in an old building. We had the bridal shower high tea here and words cannot describe the gorgeous setting of this place. If you have a car, I recommend booking in some afternoon tea here with the girls, and posing for some pretty photos in the garden. The gorgeous high tea set up at Villa Howden. Koma Ramen, Elizabeth Street, Hobart CBD – this is a cute little Korean restaurant, literally on the corner. It’s not far from the CBD, about a two minute walk from the main strip. I feel it’s one of the more authentic Korean restaurant/cafes I’ve seen and the ramen was amazing, and the kimchi even better! Baan Thai Traditional Thai Massage, 124 Murray Street, CBD – this is the perfect little retreat from all the walking you’ll do in Hobart! Booking ahead is recommended as they do tend to have busy periods. It’s on the pricier side, but well worth it -the masseuses are experienced and even though it’s in the CBD, you’re instantly transported to South-East Asia once you step inside the rooms.